In the 1970s, I went to a book sale in Tavistock, in Britain's West Country where I picked up a charming little print that looked as if it might have been Chinese. To this day, I still do not know. 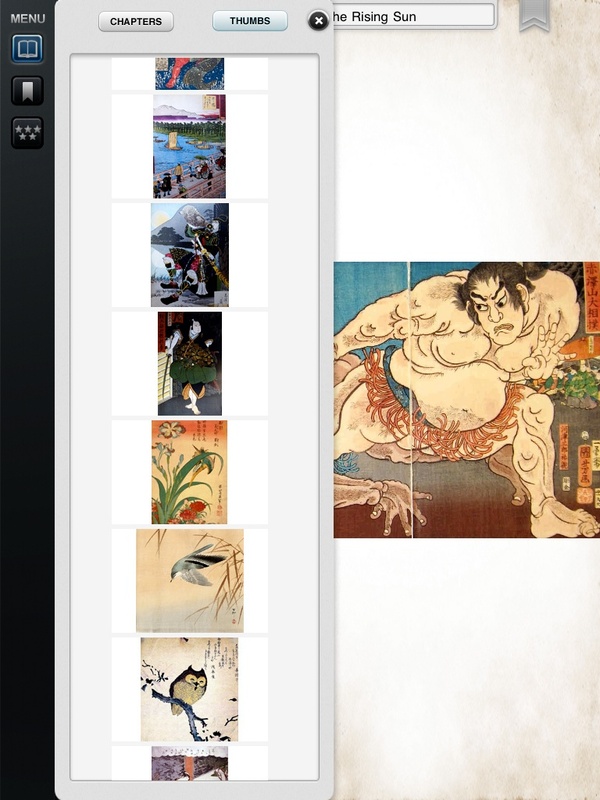 In an attempt to find out, I began reading, but got sidetracked into Japanese Art and then woodblock prints (ukiyo-e). I eventually picked up a couple of these prints: one at a Christies' auction (most exciting); and another at a shop specialising in all manner of Japanese art -- pictures, swords, Samurai armour -- in Bloomsbury, near the British Library in London. With the ideas I had been looking at back in June, with Ampersands and Gagosian Gallery apps -- not only books, but Art display fairly well on the medium of the iPad -- I downloaded an app on Japanese Art, developed by Archibald Industries who have a number of other interesting apps for the platform. 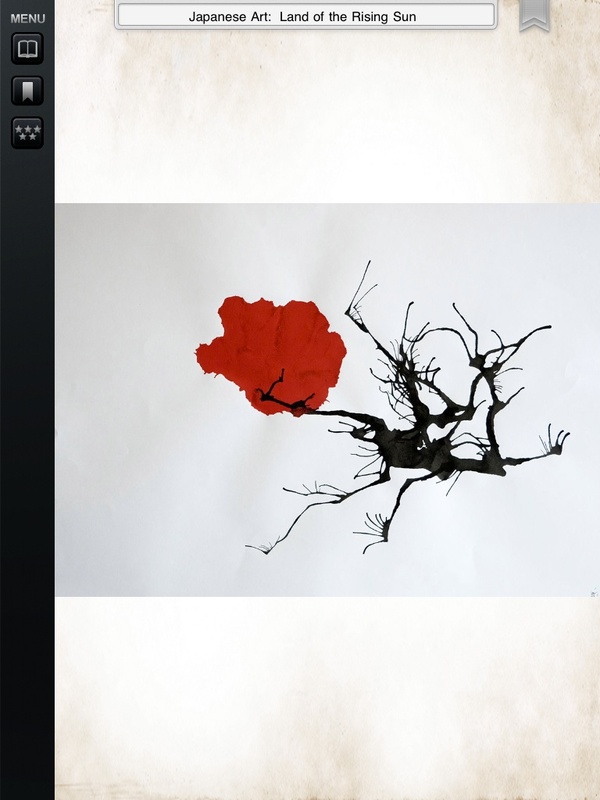 Japanese Traditional Art Gallery for iPad Lite is not the best solution I have found to displaying Art on the iPad, mainly because there is zero information included with the app. There are three control to the left: Menu, Bookmark and Star (to rate the app). The simple menu has two parts: Chapter and Thumbs. 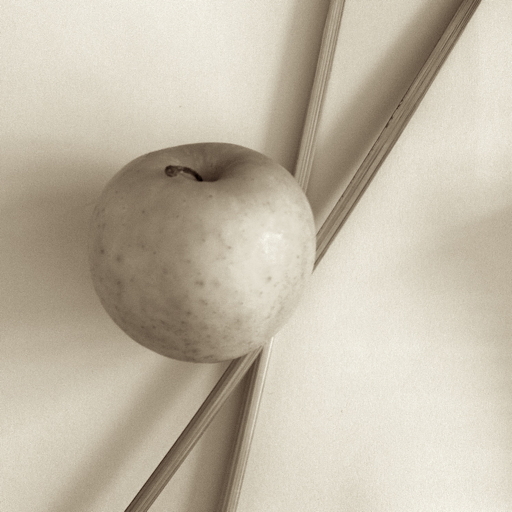 That there is only one chapter suggests either that this app idea has been borrowed; or that there is more to come. I hope it is the latter, because collections of images that are easy to access, does make some sense. Tapping on the thumbnails button in the menu system displays all the images that are included as content. As there is no downloading to do (unlike some apps) the access is instant. Tapping on a thumbnail displays the image, but the X at the top of the menu must be tapped to make the menu panel disappear, leaving just the image onscreen. This is the app's strength and its weakness. To see these images displayed is the main aim of the app. However, for anyone coming to Japanese Art with no previous knowledge, there is no information at all as to what is being shown. I was able to identify the work of Hokusai and Utamaro as well as some of the older panels and other items, because I had bought and read several reference books in the 1970s. 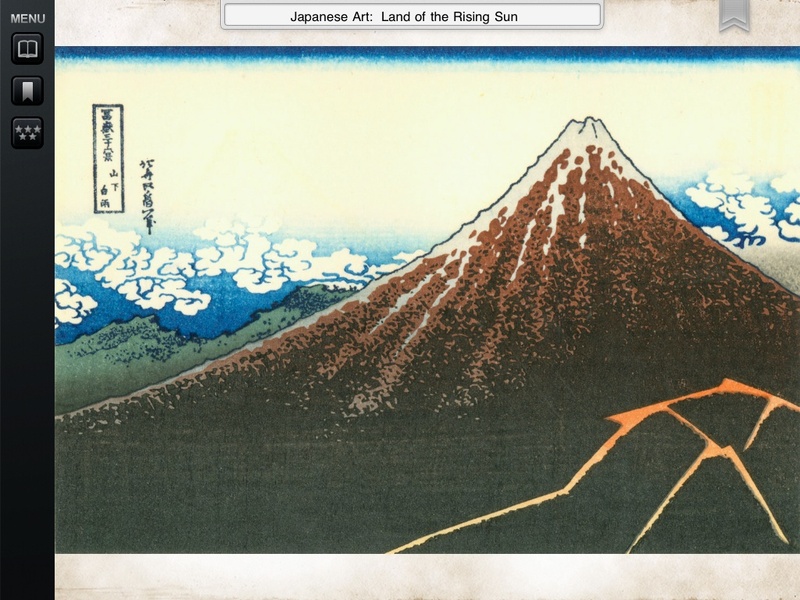 And in the case of the works of Hiroshige, I had also bought the prints. Perhaps, like my Tavistock purchase, someone looking at such images might be tempted to find out more, but this is not easy to do without so much as an artist's name. 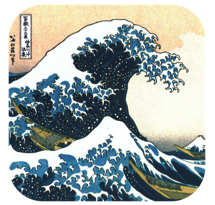 There are some 90 images, including the iconic Great Wave off Kanagawa from Hokusai's Fuji 36 Views of Mount Fuji, which also acts as the app's own icon (above). We have been reminded of this in recent times, but the universal nature of this image has been used for years. For example I can remember a political cartoon from the 1970s in a UK newspaper that used this. 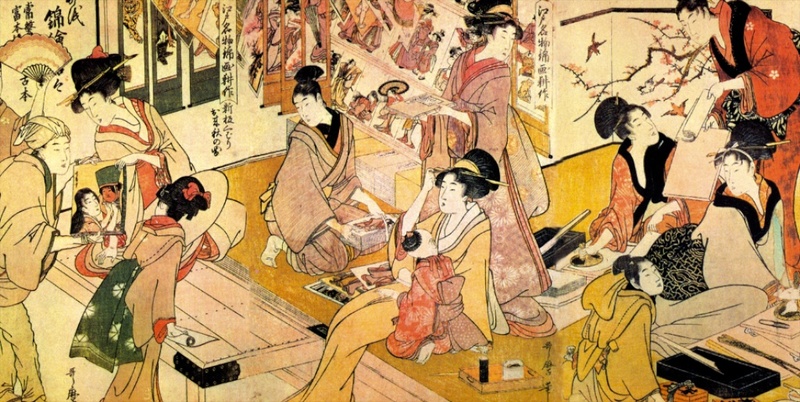 Japanese Art had a significant effect on Europeans and we are shown here some unique perspectives. 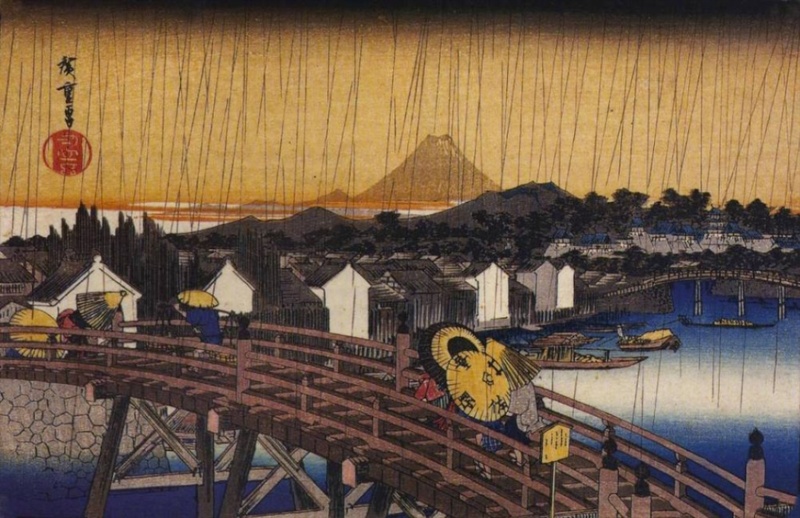 As well as Hokusai, I was reminded of Hiroshige's 100 Views of Edo (Tokyo) and others, and his influence on artists such as Van Gogh who copied a number of Hiroshige's works. Also in the prints of Hiroshige, we may see the same sort of scene styles as we would set up using a camera, for example looking at a landscape through the forked branches of a tree. 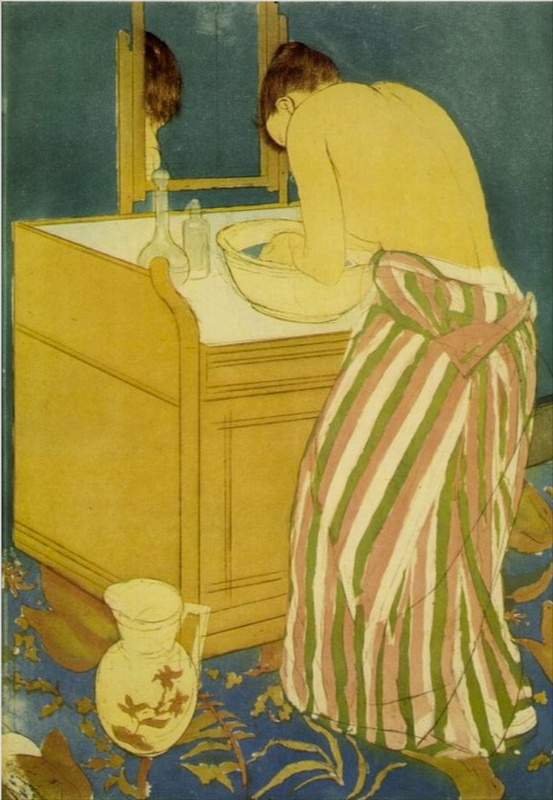 If I remember my European painters correctly one of the images of a semi-naked woman looking in a mirror, which may be by Utamaro, reminds me of a Dégas painting or other Impressionist work. I am obviously excited to be able to view these works so easily again and this time on my iPad and would recommend it -- at least have a look at another genre -- to anyone with the vaguest interest in educating themselves, with the caveat that there is a major lack of information here. The Pro version of this, which allows the user to annotate entries and to email images, costs $0.99. I was not able to upgrade from within the Lite app.